Oh goodness, how I hate to love this race! 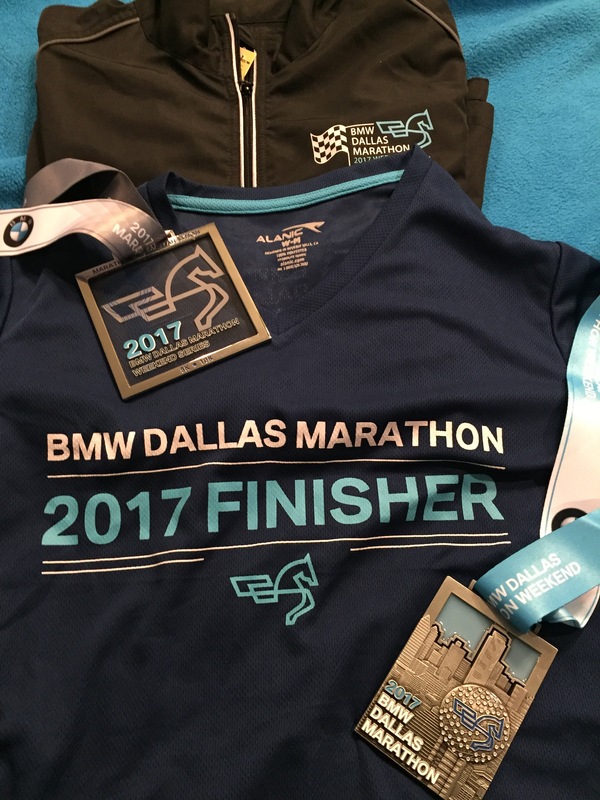 I’ve written in the past about my love/hate relationship with the Dallas Marathon, but each year I grow to love it even more. It was my first half marathon in 2010, my first full marathon in 2011, and my slowest marathon in 2012. 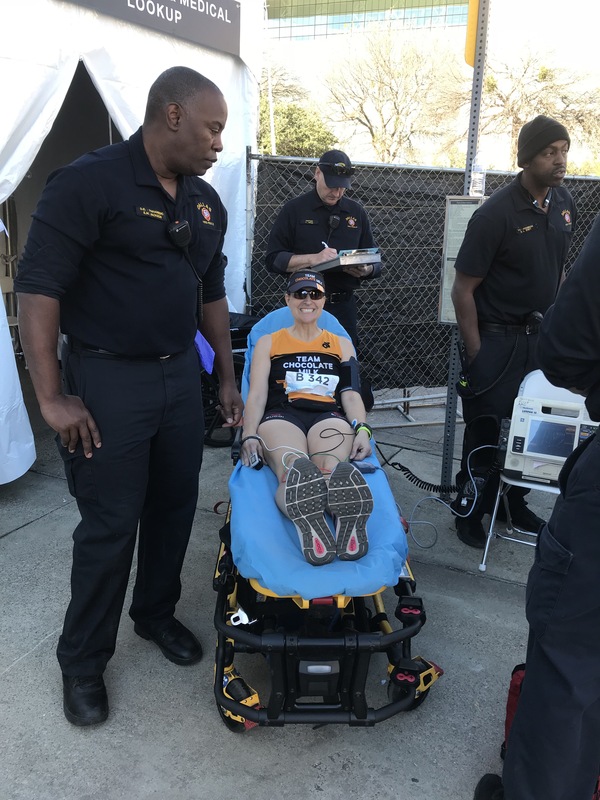 I’ve planned to run this race (the marathon) every year since, even though it’s not always the best time of year for me. I miss my goal more often than not, but the experience for the runner has improved a lot from my first time in 2011. This year, my friend and I signed up for the (inaugural) Weekend Series, which included a race on Saturday and Sunday. By completing the series, we would get some nice bonuses, namely a jacket. 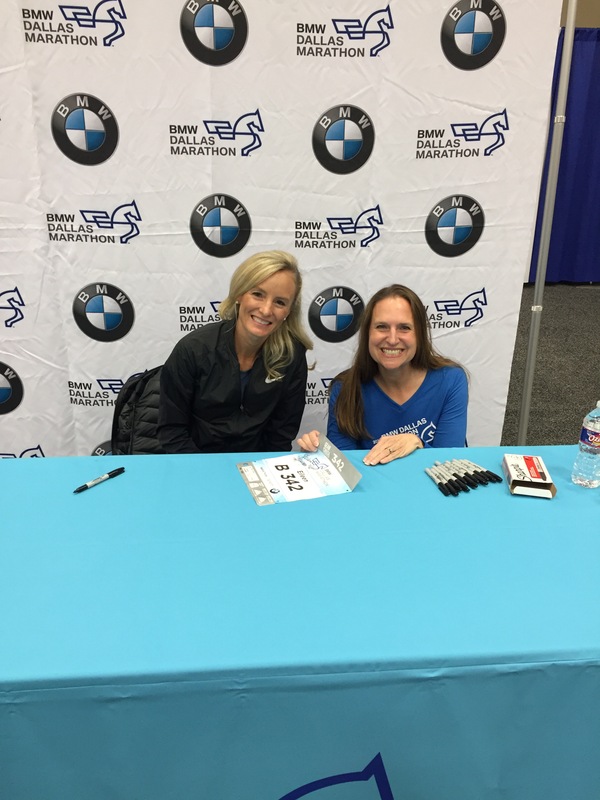 I went to the expo early on Friday, and was excited that I had the chance to meet Shalane Flanagan. I mean, it’s not every day you get to meet an Olympian who also happened to win the NYC marathon last month. 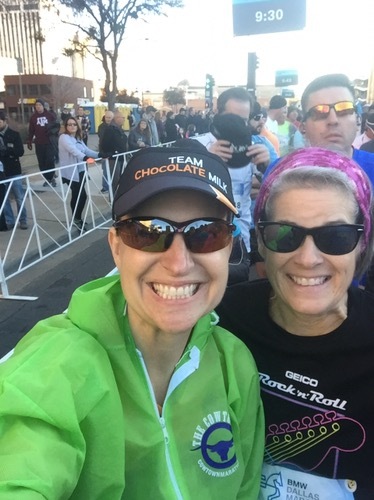 I picked up my race bibs for the 5k and marathon, my two race shirts, and for being part of the weekend series – a poster and socks. Not a bad haul so far. 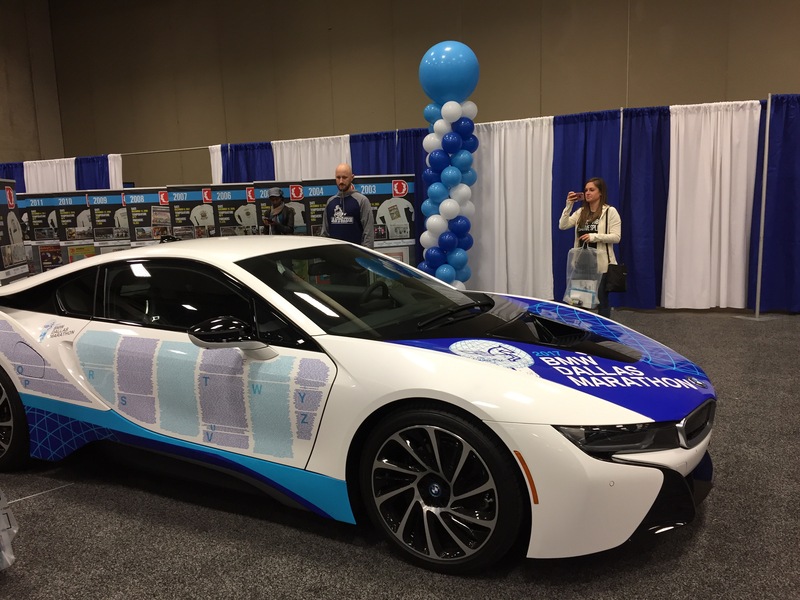 I stocked up on more Nuun at the expo, and found my name on the car. 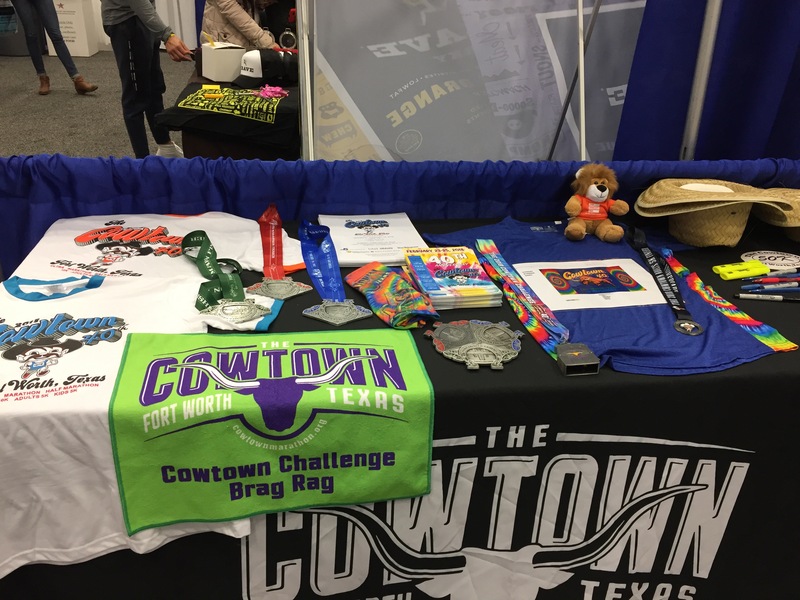 Then I stopped by to check out the Cowtown table. Saturday, Leda and I went together to the 5k. Our goal was to run easy and have fun. If we finished under 30 minutes that meant we ran too hard. My goal was to not look at my Garmin and enjoy the run. It was cold! Our time was around 31:00, and I never looked at our pace. Yay me! We kept it easy and had fun. Mission accomplished! Sunday for the marathon, the weather started off nice and cold. Temps were in the mid 30s but it was supposed to warm up to high 60s for the day. 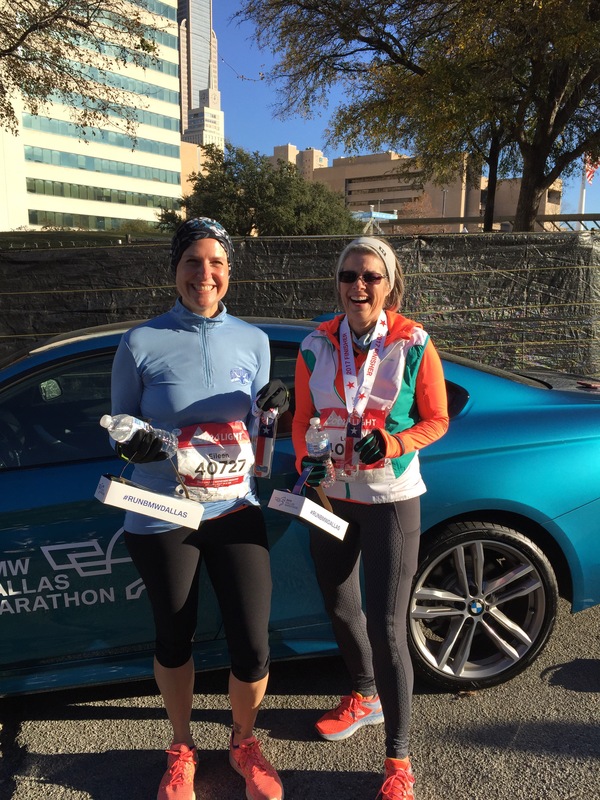 I used my Cowtown disposable jacket to stay warm at the start (and tossed it by mile 3). Leda and I had our race plan. We were going to run it together. My job was to hold her back. Her job was to keep me from settling for lesser goals. One of the runners from our group ran past us at mile 10 and yelled hello. He was running his first marathon. Then at mile 12, we saw three other friends from our group on the course cheering and taking pictures. It was great! By mile 13, Leda started pulling ahead and I didn’t feel like I could hold that pace. My stomach was feeling off, and I ducked into a porta potty somewhere during mile 15. She was too far ahead for me to call out, so I knew we were probably done running together. I was on my own. I held it close to race pace for a couple more miles, then made another stop close to mile 20. I had also refilled my handheld bottle a few times since that first stop. I used my Nuun tablets just like always. After the monster hill I walked up in mile 20, I tried to pick up the pace. But whenever I pushed, I had to back off due to nausea. I continued drinking from my bottle, and settled into a run/walk for as long as it took. I’d either feel better, or I would just finish for the jacket. I did notice for the last few miles that I was very thirsty. I probably refilled my bottle 4 times in the second half of the race, but my mouth was still dry. I also noticed that my top wasn’t drench in sweat like it was earlier in the race. 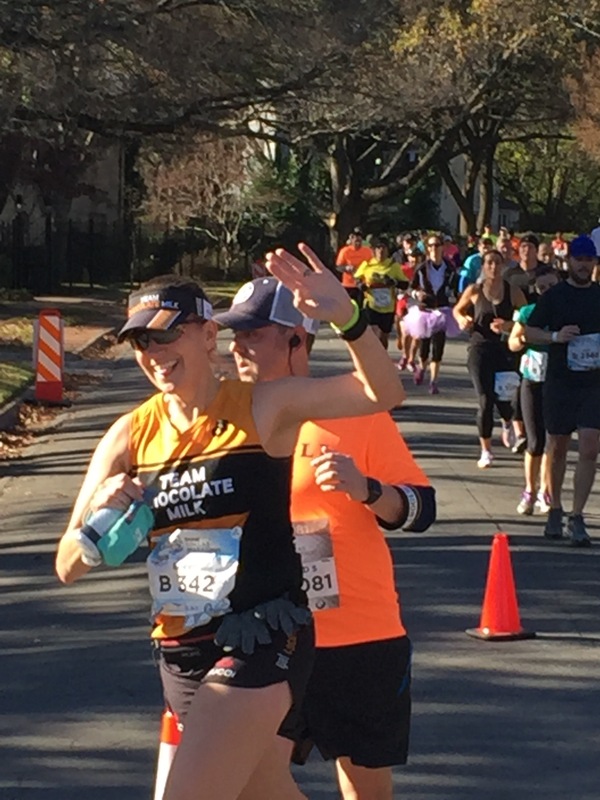 When I made it to mile 25, I mustered enough energy to run a slow final mile. I crossed the finish, smiled at my friends cheering, and picked up my jacket. 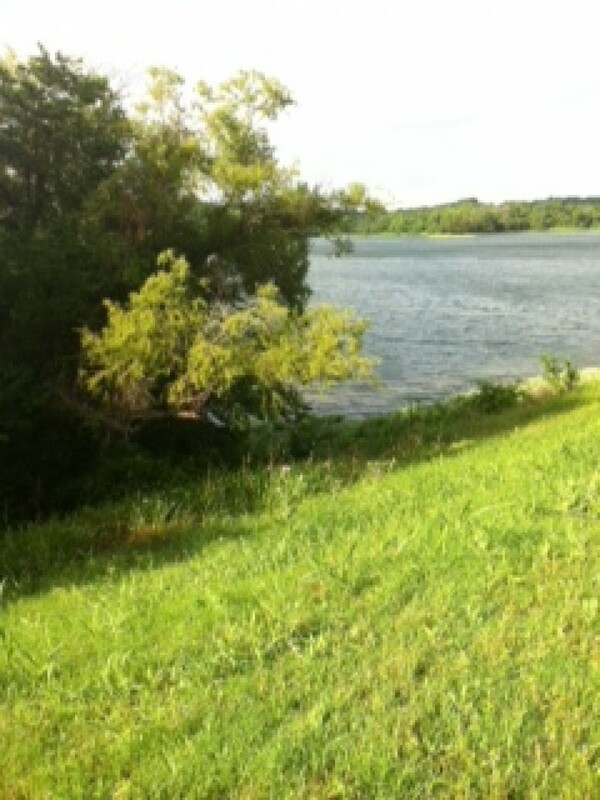 Then I worked my way to where my husband, Leda, and her husband were waiting for me. When I finally stopped moving, my face started feeling funny. A tingle and a wave of nausea had me headed to the nearest trash can. Then both of my arms started tingling, feeling numb. My stomach was still upset, so we walked over to the porta potties. When I came out, we were right by the medical tent and Leda asked me to get checked out. She said this wasn’t normal for me. I explained what was going on, and the nice guys had me take a seat. They checked my blood sugar, pulse, blood pressure, etc. They had me stay until my numbers came closer to normal and I was feeling more like myself. Really, I just wanted some pancakes, but IHOP had packed up long before. When I felt steady, we searched for a good place to take a picture, and ran across Meb. He graciously signed our bibs and took a picture with us. It was great! Then we got our picture together, tying a bow on our 20 weeks of training together. Leda did get a PR by a couple of minutes, and I’m so glad she had a good race. Me, I’m going to work on my nutrition. I didn’t carb up and hydrate enough in the days leading up to the race. I think that definitely played a part in my race. I’ve heard from several people how fast it warmed up, and I guess I just didn’t notice it. I was happy with all the goodies from race day. 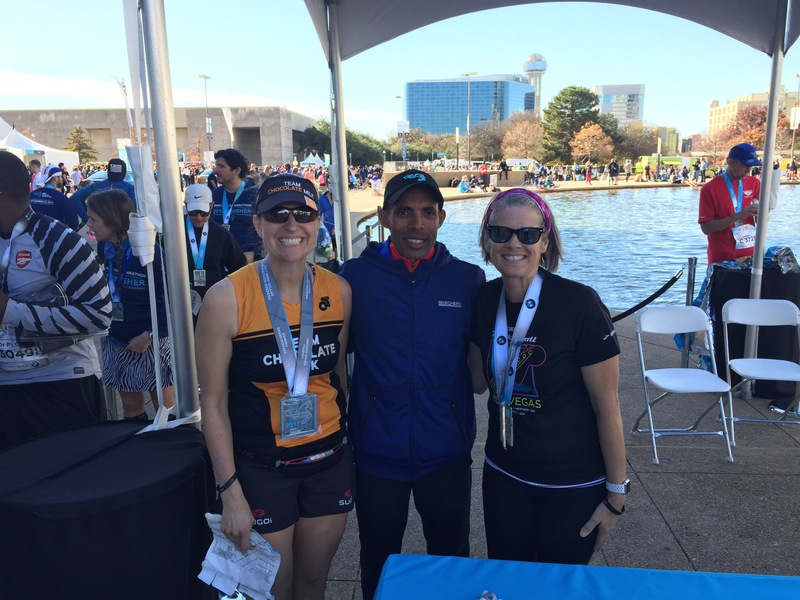 Two medals, a finisher shirt, and a jacket just for finishing Sunday’s race. I loved the medal this year too. You can flip the top back and make it stand. 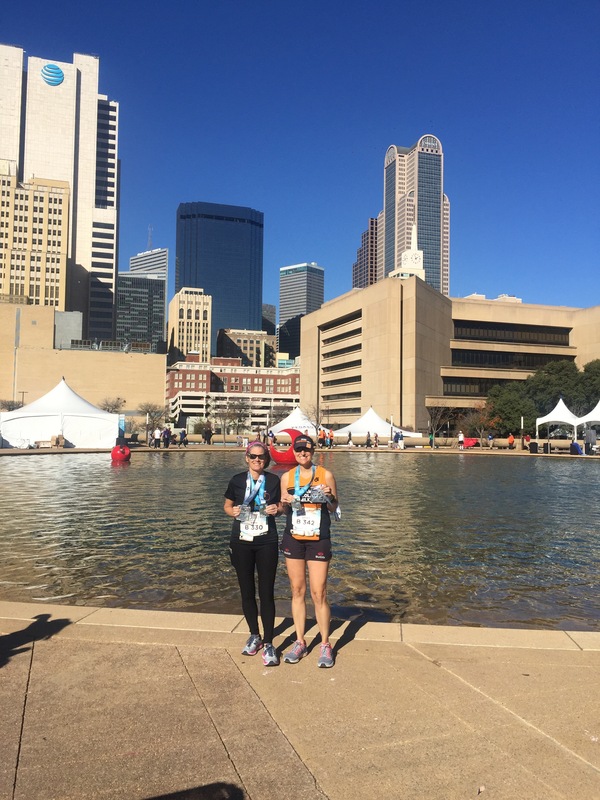 Dallas has done a good job improving the runner experience each year. I liked the course layout this year, even with the monster uphill. If you made it this far in the post, thank you for reading! I felt so much support and encouragement going into this race. I will keep pushing, and one day I’ll get to run the race I trained for.